June 12, 2018 – Six Flags Great Adventure Park President John Winkler presided over the opening of Cyborg Cyber Spin, the park’s new ABC Rides’ Tourbillion triple axis spinning attraction. This first-of-its-kind in America ride stands some 67 feet (20.5m) tall as the free rotating 24 passenger gondola spins riders around at forces up to 3.5 Gs. The Metropolis area of the park is also home to Justice League: Battle for Metropolis, the Sally Rides 3D dark ride shooter that opened in 2017. The section of the park used to be home to Batman & Robin: The Chiller, but was closed for a decade after the intertwining roller coasters closed in 2007. 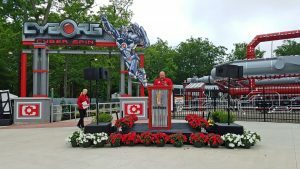 This entry was posted in News and tagged ABC Rides, Cyborg Cyber Spin, Great Adventure, Six Flags, Tourbillion. Bookmark the permalink.